There’s a lot of great conversation that happens around the office -- and the kitchen, and the studio -- at Food52. So we made a podcast about it. We’d like to introduce you to Burnt Toast, our bimonthly podcast where we talk about the things that don’t make it onto the site. Listen in as we talk food culture and controversial cooking topics and have occasional good-spirited debate about all of the above. And for each episode, we’ll con one smart, salty guest into joining in on the fun. Here, then, is Episode 1, “I Draw the Line at Tongue,” which covers all manner of strange food: What constitutes strange, the craziest things we’ve ever eaten, and how we feel about all of it. Chef, bakery owner, and cookbook author Allison Robicelli sits in with us. Things get weird. 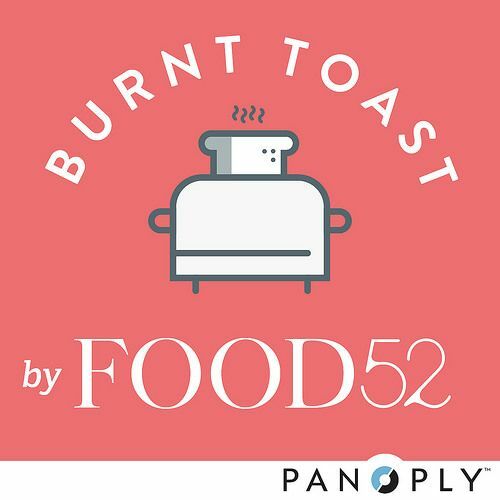 You can also stream the episode here, or download and subscribe to Burnt Toast on iTunes. And we want to see your weirdest food: Tweet or Instagram your worst with the hashtag #BurntToast -- we'll be re-sharing our favorites. Loved your show about cookbooks. Next time, I would enjoy hearing about the ones that do get dog eared in your kitchens. I just starting listening to your podcasts and I already had to google a recipe! Especially great to listen to while walking the dog. I just devoured the first two podcasts. Especially loved the second one, where you all talked about cookbooks. I hope there's a chance you'll go weekly with this! Is there a name for the green beans slow cooked in butter you talked about? They sound delicious. This is a very interesting podcast IF ONLY the girls would not say 'like' 5 time in every sentence. It is so annoying it's hard to listen for very long. Hmmmm, like, I was going to mention that as well. I started trying NOT to count the "likes". It's , like, sooooooo distracting! Like, please- stop!!!! Is it normal to reference Brooklyn every 5 minutes? There were 5 references to Brooklyn in 25 minutes! Oh, and I listened to this on Stitcher! It popped up as a recommendation, before I saw your announcement here. Finally! So happy you're podcasting. Great first episode, sharing it with everyone I know. I love podcasts, and have added your to my list right away. I have to throw this in about my favorite peanut butter pairing: a friend of mine introduced me to her favorite snack and it never occurred to me how great it would tast...she spread PB on Ritz crackers and loaded on (prepared) horse radish. Whaaat??? It was excellent! I don't eat Ritz crackers much these days, but still do this on Wasa or rice crackers. Is it possible to also post transcripts of the podcasts? Exciting! Just added it to my Pocket Cast list! Listening right now. Yay! I use Stitcher app on my android, fyi. Any chance of an RSS feed for us Android folks? I might be jumping up and down. might be.